Ten-Scenarios compatible with MMP's ASL™ System, adaptable to Critical Hit's Combat™ Tactical Wargame and other miniature Wargaming systems. 31 August 1944: The Royal 22nd Regiment moved into action before dawn in a bid to secure the right shoulder of the breach in the Gothic Line. Engineers worked through the night to clear three narrow paths in the minefield where the West Novas had earlier come to grief, Lieutenant-Colonel Jean Allard hurried two companies forward. 1 September 1944 In the centre, the Fifth Division had not been idle. Monte Peloso and Tomba di Pesaro were its primary objectives, but it took most of the day to complete their capture. The original plan called for the Perths and Strathconas to attack Peloso, but this had to be revised when it became apparent that fresh infantry would be needed. 15 September 1944 Eighth Army designated the Canadian Corps as its pursuit corps and placed the British 4th and 2nd New Zealand divisions, the British 25th Army Tank Brigade, and the 3rd Greek Mountain Brigade. The Canadian Corps was to launch its assault as soon as the rains stopped. 18 September 1944 The situation on the First Canadian Division’s front was not so happy. Unlike the British V Corps, the Canadian First Division commander Chris Vokes was unable to offer assurances about getting over the Ausa on the 18th and nothing could be done until San Martino had been recaptured and the first had moved up to the Rimini railway line. Finesse had not worked thus far, thus the Vokes decided to try brute force. 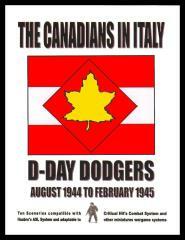 23 September 1944 Intent on debouching into the broad valley of the Po, the First Canadian Corps poured troops and tanks through the Marecchia bridgehead. General Burns had designated three successive rivers as the main objectives of the coming operations, the Fiumicino, the Savio, and the Ronco, twenty-five miles beyond the Marecchia. 5 December 1944 The First Division was having problems. Despite committing it’s reserve unit, the Carleton and York Regiment, the Third Brigade was unable to get beyond the Lamone. By the morning of 4 December, 48-hours after launching its first attacks, the brigade had finally closed up to the river, to find that the Germans had retired behind the blown railway and road bridges. 15 December 1944 While the Fifth Division pushed across the Naviglio and closed up to the Fosso Munio, the First Division staged a series of local attacks to widen its bridgehead for break-out. During the night of 14-15 December, Princess Patricia’s Canadian Light Infantry moved over the canal, with the task of driving the Germans out of ancient, walled Bagnacavallo, where many of the enemy counter-attacks had originated. 20 December 1944 There was no let-up. A determined Charles Foulkes met with his Division commanders within hours after the First Brigades failure on the Fosso Vecchio. New plans were drawn up for yet another joint assault between the First and Fifth Divisions that very night. The object was to force the Germans to abandon the S-shaped Fosso Munio and retire behind the Senio and the task was given to two infantry brigades, the Second and Eleventh, both using two-assault battalions. 2 January 1945 The quiet along the Senio was about to be shattered. At either end of the Canadian sector were pockets of German troops and I Corps headquarters had decided to get rid of them before settling down for the winter. On the right, north of Ravenna, the Germans were huddled behind a web of canals and rivers, below the Lago Comacchio along the line extending from the coast to Alfonsine, where it linked up with the Senio defenses.